A Save Our Heritage Project. The reason the British came to Concord on April 19th. The birthplace of the Environmental Movement. Home of the Alcotts and the setting for "Little Women"
Where the "shot heard round the world" was fired. That State and Federal designations are enacted recognizing the historical and environmental significance of this area. 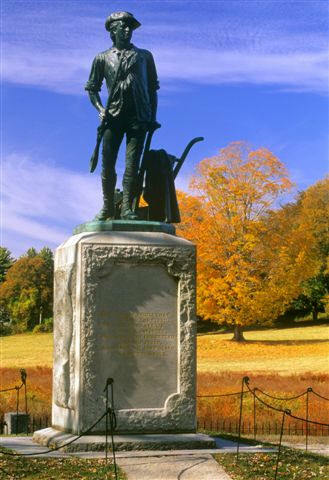 To achieve permanent protections for the national historical, cultural, and environmental resources in the Massachusetts towns of Concord, Bedford, Lincoln, and Lexington in order to prevent their gradual degradation by pollution, noise, and development. These landmarks have been declared one of the "11 Most Endangered Historic Places in America" by the National Trust for Historic Preservation, and designated a "Last Chance Landscape" by Scenic America. According to these organizations, the primary threat is the expansion and commercialization of the Airport at Hanscom Field, which is located adjacent to these irreplaceable resources (not to be confused with Hanscom Air Force Base, a valued partner to the communities). The potential traffic, noise, development, and pollution generated by the airport would overwhelm and permanently change the character of the area and will deprive future generations the experience of visiting, learning from, and enjoying these national landmarks. A number of well known historians and environmentalists provide compelling arguments for why we need to protect these resources.